Halekulani executive chef Vikram Garg adds batter to the grill to make rice and lentil pancakes called uttapam, as well as a larger crepe made from the same batter. Various fresh toppings give uttapam a pizzalike look. The four regions of India each have their own version of classic street foods, and within those regions the various states present their own variations, with individual cooks and families adding their own touches to the dishes, chef Vikram Garg said. “There’s no standard, no set recipes,” he said. 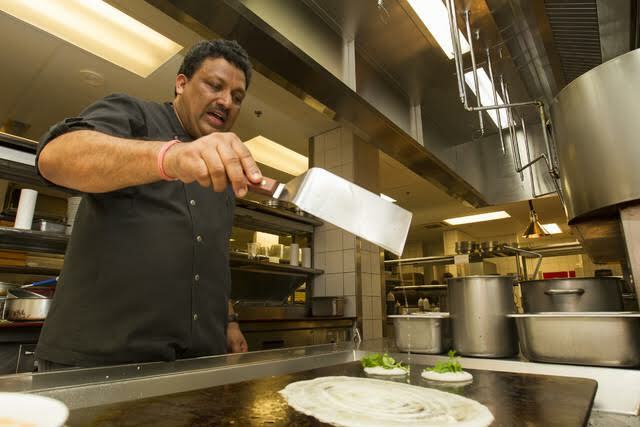 As executive chef at the Halekulani, Garg has explored many variations on the cuisine to prepare for a Jan. 31 benefit dinner dedicated to Indian street food. >> Chaat: Popular morsels covered in a variety of toppings that offer the range of flavors — sweet, savory and spicy. Aloo chaat starts with a bed of pan-fried potato cubes; papdi chaat starts with a flat, deep-fried disc; and bhalla chaat features dumplings made with soaked, ground lentils ground into a batter. Toppings include yogurt, cilantro, mint, tamarind chutney, and chili and mango powder. >> Pakora: Call this one an Indian tempura, veggies dipped in batter made with chickpea flour and deep-fried. Toppings: tamarind chutney, yogurt, mango powder. >> Uttapam: Soaked and ground lentils and rice is fermented and then made into a batter, then cooked in a pan with toppings such as tomatoes, onions and chilies. It resembles a pizza. Garg said the dish is sometimes served with a chutney of fresh coconut. >> Kebab: Cubed, skewered foods cooked on a grill. Served with parotta, a layered flatbread, and topped with such items as cucumber and onion, rolled up and eaten. >> Vindaloo: Braised pork cooked with fenny, a liquor made of fermented cashew sap, and spices. The dish is a result of the Portuguese influence on the western part of India called Goa, which they colonized from the 16th to 20th centuries. Carne de vinha d’alhos, a similar pork dish braised in vinegar and garlic, is a classic of Portuguese cuisine. >> Dal makhani: This dish is a fortifying combo of black lentils, chili powder, ginger and homemade butter, traditionally cooked for 72 hours in a tandoor and served with freshly made naan. Garg says the classic dish comes with a historical tale: When warriors left their village home to fight, the women made dal makhani in a communal tandoor and kept it warm for the soldiers’ return. When one would drop in for a short respite from fighting, the women made a quick batch of naan and went to the tandoor to serve up the lentils. The dish became known for restoring a tired, hungry warrior.